It was a day I'll never forget. I was teaching my last period Algebra class and it was time for the end of the day announcements. "Girls basketball practice has been canceled." The three girls basketball players in the class let out a whoop like they had just won the state championship! I was the boys coach, so I didn't take it personally, but it did make me think. If they didn't see the value of practice, my boys players probably didn't either. I went on a mission to make it clear to the players I coached that if you want to play well on game night, you must be a great practice player. Practice performance, good or bad, carries over to games. 1) It's not practice, it's rehearsal. Stage shows have rehearsals, so should basketball teams. Drills in practice should be nothing more than rehearsing the things that happen in games as close to the way that they happen. Break down what you want to happen so that you aren't running drills, you are playing basketball at game pace. 2) What's the score? Find a way to make every drill you use competitive. It can be against another player or team, or against a standard of excellence that you require. Players must know if they are performing at a level that translates to success in games. 3) It's on you, coach. You will get in games what you emphasize and specifically teach in practice. That requires being consistent in coaching basketball with energy...every minute of every drill of every practice. If it won't work in games, you can't tolerate it in practice. 4) Less is more. Doing 10 reps in a drill requiring game like all out effort, perfect technique, penalizing turnovers, finishing with a rebound battle, and requiring all defensive slides to be game pace will prepare you for games better than double the reps with no accountability. 5) Break the rules. 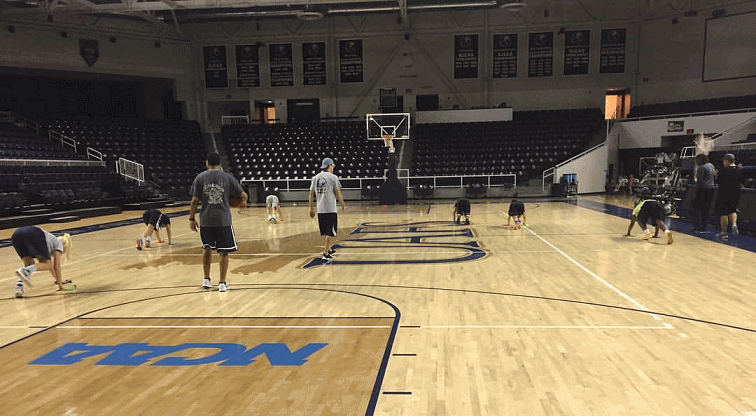 Overload your players to make it tougher in practice than games. Make the defense play with only 4 players, have players dribble 2 basketballs in drills, allow the second team defense to use their hands to guard, and anything else that will push your players beyond their current abilities. 6) Let's go to the replay monitor. Regardless of when it happens, if you don't get the expected standard of excellence in a drill or scrimmage possession, stop, make the needed corrections, and then do it again. And again if needed. I once saw a Division 1 Coach do 2-line layups for 20 minutes because he wasn't getting the effort he wanted. Passes were sloppy, missed layups, no hustle, and other problems. They did it until it was right. The final piece of the practice puzzle is for you, the coach, to work on yourself so that you consistently summon the energy to inspire your players to practice excellence and to confront and correct when it isn't there.